Keeping Up With Kids' Online Privacy Smartphones, tablets and more affordable laptops mean that children are becoming computer literate younger than ever. But are online privacy laws and protections keeping up with them? NPR's Michel Martin learns more from Rey Junco of Harvard's Berkman Center for Internet and Society. 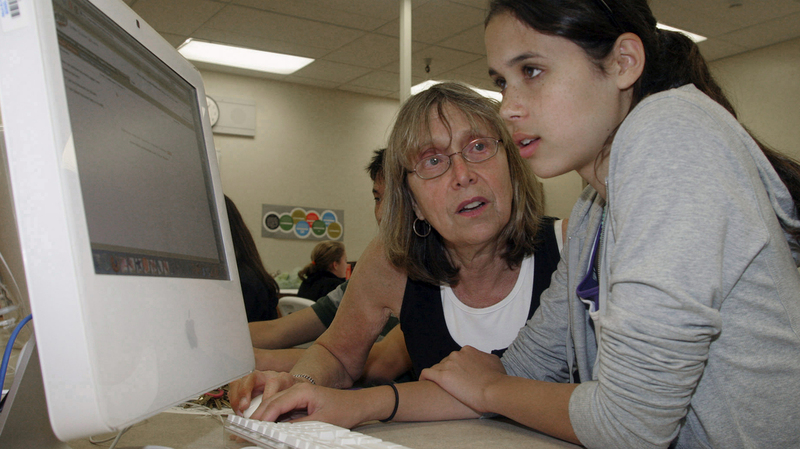 Palo Alto High School teacher Esther Wojcicki helps student Allison Wyndham at a computer during class. "Youth are much savvier about their online privacy than most adults give them credit for," says Rey Junco, a faculty associate at the Berkman Center for Internet and Society. In the final installment of Tell Me More's series Social Me, Junco tells NPR's Michel Martin that research into teenagers' online behavior on sites like Facebook show that they adjust privacy settings and behave in ways that prove "they're very aware of privacy issues." Can Online Anonymity Be A Good Thing? But that's not to say kids don't need further protection. Junco explains that the Children's Online Privacy Protection Act, or COPPA, was set up to keep their information private. And it has recently been revised to keep up with the changing technologies available to children. Social Media: OMG! Do Parents Get It? Before the rules were updated, Junco explains, developers of kids' applications were collecting information without any warning. They used "basically a loophole in COPPA that didn't cover a new technology such as mobile devices," Junco says. He points out that mobile technologies are not new to consumers, but "because COPPA has been around for so long," it still needs to catch up with all the technology available, and to make provisions for what is on the way. These days, anyone who goes online must be aware that their personal information and search histories can be tracked. There are tools for your browser that can block this monitoring, but the challenge is today's Internet business model. Even websites that are free to access make money, because data is "harvested and used for advertising." Junco explains that this is done "in ways that we would consider an unacceptable privacy breach for our children." Junco says COPPA is working on ensuring that kids are safe online, but there's still a ways to go. "I don't think that there are going to be static rules that are going to hold for very long periods of time, given the rapid advances in technology that we see," Junco says. "But I think it's important to have a process by which the [Federal Trade Commission] can continually make and enforce updates."